This article is about the air force of Germany before and during World War II. For the West German and current air force of Germany, see German Air Force. For the air force of the German Democratic Republic, see Air Forces of the National People's Army. For the air force of the German Empire, see Luftstreitkräfte. The Luftwaffe[N 2] (German pronunciation: [ˈlʊftvafə] ( listen)) was the aerial warfare branch of the combined German Wehrmacht military forces during World War II. Germany's military air arms during World War I, the Luftstreitkräfte of the Army and the Marine-Fliegerabteilung of the Navy, had been disbanded in May 1920 as a result of the terms of the Treaty of Versailles which stated that Germany was forbidden to have any air force. During the interwar period, German pilots were trained secretly in violation of the treaty at Lipetsk Air Base. With the rise of the Nazi Party and the repudiation of the Versailles Treaty, the Luftwaffe was officially established on 26 February 1935, just over a fortnight before open defiance of the Versailles Treaty through German re-armament and conscription would be announced on March 16. The Condor Legion, a Luftwaffe detachment sent to aid Nationalist forces in the Spanish Civil War, provided the force with a valuable testing ground for new tactics and aircraft. Partially as a result of this combat experience, the Luftwaffe had become one of the most sophisticated, technologically advanced, and battle-experienced air forces in the world when World War II broke out in 1939. By the summer of 1939, the Luftwaffe had twenty-eight Geschwader (wings). The Luftwaffe also operated Fallschirmjäger paratrooper units. The Luftwaffe proved instrumental in the German victories across Poland and Western Europe in 1939 and 1940. During the Battle of Britain, however, despite inflicting severe damage to the RAF's infrastructure and, during the subsequent Blitz, devastating many British cities, the German air force failed to batter the beleaguered British into submission. From 1942, Allied bombing campaigns gradually destroyed the Luftwaffe's fighter arm. From late 1942, the Luftwaffe used its surplus ground, support and other personnel to raise Luftwaffe Field Divisions. In addition to its service in the West, the Luftwaffe operated over the Soviet Union, North Africa and Southern Europe. Despite its belated use of advanced turbojet and rocket propelled aircraft for the destruction of Allied bombers, the Luftwaffe was overwhelmed by the Allies' superior numbers and improved tactics, and a lack of trained pilots and aviation fuel. In January 1945, during the closing stages of the Battle of the Bulge, the Luftwaffe made a last-ditch effort to win air superiority, and met with failure. With rapidly dwindling supplies of petroleum, oil, and lubricants after this campaign, and as part of the entire combined Wehrmacht military forces as a whole, the Luftwaffe ceased to be an effective fighting force. After the defeat of Germany, the Luftwaffe was disbanded in 1946. During World War II, German pilots claimed roughly 70,000 aerial victories, while over 75,000 Luftwaffe aircraft were destroyed or significantly damaged. Of these, nearly 40,000 were lost entirely. The Luftwaffe had only two commanders-in-chief throughout its history: Hermann Göring and later Generalfeldmarschall Robert Ritter von Greim for the last two weeks of the war. The Luftwaffe was deeply involved in Nazi war crimes. By the end of the war, a significant percentage of aircraft production originated in concentration camps, an industry employing tens of thousands of prisoners. [N 3] The Luftwaffe's demand for labor was one of the factors that led to the deportation and murder of hundreds of thousands of Hungarian Jews in 1944. The Luftwaffe High Command organized Nazi human experimentation, and Luftwaffe ground troops committed massacres in Italy, Greece, and Poland. The Imperial German Army Air Service was founded in 1910 with the name Die Fliegertruppen des deutschen Kaiserreiches, most often shortened to Fliegertruppe. It was renamed Luftstreitkräfte on 8 October 1916. The air war on the Western Front received the most attention in the annals of the earliest accounts of military aviation, since it produced aces such as Manfred von Richthofen and Ernst Udet, Oswald Boelcke, and Max Immelmann. After the defeat of Germany, the service was dissolved on 8 May 1920 under the conditions of the Treaty of Versailles, which also mandated the destruction of all German military aircraft. Since the Treaty of Versailles forbade Germany to have an air force, German pilots trained in secret. Initially, civil aviation schools within Germany were used, yet only light trainers could be used in order to maintain the façade that the trainees were going to fly with civil airlines such as Deutsche Luft Hansa. To train its pilots on the latest combat aircraft, Germany solicited the help of the Soviet Union, which was also isolated in Europe. A secret training airfield was established at Lipetsk in 1924 and operated for approximately nine years using mostly Dutch and Soviet, but also some German, training aircraft before being closed in 1933. This base was officially known as 4th squadron of the 40th wing of the Red Army. Hundreds of Luftwaffe pilots and technical personnel visited, studied and were trained at Soviet air force schools in several locations in Central Russia. Roessing, Blume, Fosse, Teetsemann, Heini, Makratzki, Blumendaat, and many other future Luftwaffe aces were trained in Russia in joint Russian-German schools that were set up under the patronage of Ernst August Köstring. The first steps towards the Luftwaffe's formation were undertaken just months after Adolf Hitler came to power. Hermann Göring, a World War I ace, became National Kommissar for aviation with former Luft Hansa director Erhard Milch as his deputy. In April 1933 the Reich Aviation Ministry (Reichsluftfahrtministerium or RLM) was established. The RLM was in charge of development and production of aircraft. Göring's control over all aspects of aviation became absolute. On 25 March 1933 the German Air Sports Association absorbed all private and national organizations, while retaining its 'sports' title. On 15 May 1933, all military aviation organizations in the RLM were merged, forming the Luftwaffe; its official 'birthday'. The National Socialist Flyers Corps (Nationalsozialistisches Fliegerkorps or NSFK) was formed in 1937 to give pre-military flying training to male youths, and to engage adult sport aviators in the Nazi movement. Military-age members of the NSFK were drafted into the Luftwaffe. As all such prior NSFK members were also Nazi Party members, this gave the new Luftwaffe a strong Nazi ideological base in contrast to the other branches of the Wehrmacht (the Heer (Army) and Kriegsmarine (Navy)). Göring played a leading role in the buildup of the Luftwaffe in 1933–36, but had little further involvement in the development of the force after 1936, and Milch became the "de facto" minister until 1937. Another prominent figure in German air power construction this time was Helmuth Wilberg. Wilberg later played a large role in the development of German air doctrine. Having headed the Reichswehr air staff for eight years in the 1920s, Wilberg had considerable experience and was ideal for a senior staff position. Göring considered making Wilberg Chief of Staff (CS). However, it was revealed Wilberg had a Jewish mother. For that reason Göring could not have him as CS. Not wishing his talent to go to waste, Göring ensured the racial laws of the Third Reich did not apply to him. Wilberg remained in the air staff, and under Walther Wever helped draw up the Luftwaffe's principle doctrinal texts, "The Conduct of the Aerial War" and "Regulation 16". Walther Wever, Chief of the Luftwaffe General Staff, 1933–1936. The German officer Corps was keen to develop strategic bombing capabilities against its enemies. However, economic and geopolitical considerations had to take priority. The German air power theorists continued to develop strategic theories, but emphasis was given to army support, as Germany was a continental power and expected to face ground operations following any declaration of hostilities. For these reasons, between 1933 and 1934, the Luftwaffe's leadership was primarily concerned with tactical and operational methods. In aerial terms, the army concept of Truppenführung was an operational concept, as well as a tactical doctrine. In World War I, the Fliegertruppe's initial, 1914–15 era Feldflieger Abteilung observation/reconnaissance air units, each with six two-seater aircraft apiece, had been attached to specific army formations and acted as support. Dive bomber units were considered essential to Truppenführung, attacking enemy headquarters and lines of communications. Luftwaffe "Regulation 10: The Bomber" (Dienstvorschrift 10: Das Kampfflugzeug), published in 1934, advocated air superiority and approaches to ground attack tactics without dealing with operational matters. Until 1935, the 1926 manual "Directives for the Conduct of the Operational Air War" continued to act as the main guide for German air operations. The manual directed OKL to focus on limited operations (not strategic operations): the protection of specific areas and support of the army in combat. With an effective tactical-operational concept, the German air power theorists needed a strategic doctrine and organisation. Robert Knauss, a serviceman (not pilot) in the Luftstreitkräfte during World War I, and later an experienced pilot with Lufthansa, was a prominent theorist of air power. Knauss promoted the Giulio Douhet theory that air power could win wars alone by destroying enemy industry and breaking enemy morale by "terrorizing the population" of major cities. This advocated attacks on civilians. The General Staff blocked the entry of Douhet's theory into doctrine, fearing revenge strikes against German civilians and cities. In December 1934, Chief of the Luftwaffe General Staff Walther Wever sought to mould the Luftwaffe's battle doctrine into a strategic plan. At this time, Wever conducted war games (simulated against France) in a bid to establish his theory of a strategic bombing force that would, he thought, prove decisive by winning the war through the destruction of enemy industry, even though these exercises also included tactical strikes against enemy ground forces and communications. In 1935, "Luftwaffe Regulation 16: The Conduct of the Air War" was drawn up. In the proposal, it concluded, "The mission of the Luftwaffe is to serve these goals." Corum states that under this doctrine, the Luftwaffe leadership rejected the practice of "terror bombing" (see Luftwaffe strategic bombing doctrine). According to Corum terror bombing was deemed to be "counter-productive", increasing rather than destroying the enemy's will to resist. Such bombing campaigns were regarded as diversion from the Luftwaffe's main operations; destruction of the enemy armed forces. Wever began planning for a strategic bomber force and sought to incorporate strategic bombing into a war strategy. He believed that tactical aircraft should only be used as a step to developing a strategic air force. In May 1934, Wever initiated a seven-year project to develop the so-called "Ural bomber", which could strike as far as into the heart of the Soviet Union. In 1935, this design competition led to the Dornier Do 19 and Junkers Ju 89 prototypes, although both were underpowered. In April 1936, Wever issue requirements for the 'Bomber A' design competition: a range of 6,700 km (4,163 mi) with a 900 kg (1,984 lb) bomb load. However Wever's vision of a "Ural" bomber was never realised, and his emphasis on strategic aerial operations was lost. The only design submittal for Wever's 'Bomber A' that reached production was Heinkel's Projekt 1041, which culminated in the production and frontline service as Germany's only operational heavy bomber, the Heinkel He 177, on 5 November 1937, the date on which it received its RLM airframe number. In 1935, the military functions of the RLM were grouped into Oberkommando der Luftwaffe (OKL; "Air Force High Command"). Following the untimely death of Walther Wever in early June 1936 in an aviation-related accident, by the late 1930s the Luftwaffe had no clear purpose. The air force was not subordinated to the army support role, and it was not given any particular strategic mission. German doctrine fell between the two concepts. The Luftwaffe was to be an organization capable of carrying out broad and general support tasks rather than any specific mission. Mainly, this path was chosen to encourage a more flexible use of air power and offer the ground forces the right conditions for a decisive victory. In fact, on the outbreak of war, only 15% of the Luftwaffe's aircraft were devoted to ground support operations, counter to the long-held myth that the Luftwaffe was designed for only tactical and operational missions. Wever's participation in the construction of the Luftwaffe came to an abrupt end on 3 June 1936 when he was killed along with his engineer in a Heinkel He 70 Blitz, ironically on the very day that his "Bomber A" heavy bomber design competition was announced. After Wever's death Göring began taking more of an interest in the appointment of Luftwaffe staff officers. Göring appointed his successor Albert Kesselring as Chief of Staff and Ernst Udet to head the Reich's Air Ministry Technical Office (Technisches Amt), although he was not a technical expert. Despite this Udet helped change the Luftwaffe's tactical direction towards fast medium bombers to destroy enemy air power in the battle zone rather than through industrial bombing of its aviation production. The failure of the Luftwaffe to progress further towards attaining a strategic bombing force was attributable to several reasons. Many in the Luftwaffe command believed medium bombers to be sufficient power to launch strategic bombing operations against Germany's most likely enemies; France, Czechoslovakia, and Poland. The United Kingdom presented greater problems. General der Flieger Hellmuth Felmy, commander of Luftflotte 2 in 1939, was charged with devising a plan for an air war over the British Isles. Felmy was convinced that Britain could be defeated through morale bombing. Felmy noted the alleged panic that had broken out in London during the Munich crisis, evidence he believed of British weakness. A second reason was technical. German designers had never solved the issues of the Heinkel He 177A's design difficulties, brought on by the requirement from its inception on 5 November 1937 to have moderate dive bombing capabilities in a 30-meter wingspan aircraft. Moreover, Germany did not possess the economic resources to match the later British and American effort of 1943–1944, particularly in large-scale mass production of high power output aircraft engines (with output of over least 1,500 kW (2,000 hp). In addition, OKL had not foreseen the industrial and military effort strategic bombing would require. By 1939 the Luftwaffe was not much better prepared than its enemies to conduct a strategic bombing campaign, with fatal results during the Battle of Britain. The German rearmament program faced difficulties acquiring raw materials. Germany imported most of its essential materials for rebuilding the Luftwaffe, in particular rubber and aluminium. Petroleum imports were particularly vulnerable to blockade. Germany pushed for synthetic fuel plants, but still failed to meet demands. In 1937 Germany imported more fuel than it had at the start of the decade. By the summer 1938 only 25% of requirements could be covered. In steel materials, industry was operating at barely 83% of capacity, and by November 1938 Göring reported the economic situation was serious. The Oberkommando der Wehrmacht (OKW), the overall command for all German military forces, ordered reductions in raw materials and steel used for armament production. The figures for reduction were substantial: 30% steel, 20% copper, 47% aluminium, and 14% rubber. Under such circumstances, it was not possible for Milch, Udet, or Kesselring to produce a formidable strategic bombing force even had they wanted to do so. The lack of strategic capability should have been apparent much earlier. The Sudeten Crisis highlighted German unpreparedness to conduct a strategic air war (although the British and French were in a much weaker position), and Hitler ordered the Luftwaffe be expanded to five times its earlier size. OKL badly neglected the need for transport aircraft; even in 1943, transport units were described as Kampfgeschwadern zur besonderen Verwendung ("Bomber Units on Special Duties", KGzbV). and only grouping them together into dedicated cargo and personnel transport wings (Transportgeschwader) during that year. In March 1938, as the Anschluss was taking place, Göring ordered Felmy to investigate the prospect of air raids against Britain. Felmy concluded it was not possible until bases in Belgium and the Netherlands were obtained and the Luftwaffe had heavy bombers. It mattered little, as war was avoided by the Munich Agreement, and the need for long-range aircraft did not arise. These failures were not exposed until wartime. In the meantime German designs of mid-1930s origin such as the Messerschmitt Bf 109, Heinkel He 111, Junkers Ju 87 Stuka, and Dornier Do 17, performed very well. All first saw active service in the Condor Legion against Soviet-supplied aircraft. The Luftwaffe also quickly realized the days of the biplane fighter were finished, the Heinkel He 51 being switched to service as a trainer. Particularly impressive were the Heinkel and Dornier, which fulfilled the Luftwaffe's requirements for bombers that were faster than 1930s-era fighters, many of which were biplanes or strut-braced monoplanes. Despite the participation of these aircraft (mainly from 1938 onward), it was the venerable Junkers Ju 52 (which soon became the backbone of the Transportgruppen) that made the main contribution. During the Spanish Civil War Hitler remarked, "Franco ought to erect a monument to the glory of the Junkers Ju 52. It is the aircraft which the Spanish revolution has to thank for its victory." Poor accuracy from level bombers in 1937 led the Luftwaffe to grasp the benefits of dive-bombing. The latter could achieve far better accuracy against tactical ground targets than heavier conventional bombers. Range was not a key criterion for this mission. It was not always feasible for the Army to move heavy artillery over recently captured territory to bombard fortifications or support ground forces, and dive bombers could do the job more quickly. Dive bombers, often single-engine two-man machines, could achieve better results than larger six or seven-man aircraft, at a tenth of the cost and four times the accuracy. This led to Udet championing the dive bomber, particularly the Junkers Ju 87. Udet's "love affair" with dive bombing seriously affected the long-term development of the Luftwaffe, especially after General Wever's death. The tactical strike aircraft programs were meant to serve as interim solutions until the next generation of aircraft arrived. In 1936 the Junkers Ju 52 was the backbone of the German bomber fleet. This led to a rush on the part of the RLM to produce the Junkers Ju 86, Heinkel He 111, and Dornier Do 17 before a proper evaluation was made. The Ju 86 was poor while the He 111 showed most promise. The Spanish Civil War convinced Udet (along with limited output from the German munitions industry) that wastage was not acceptable in munition terms. Udet sought to build dive bombing into the Junkers Ju 88 and conveyed the same idea, initiated specifically by OKL for the Heinkel He 177, approved in early November 1937. In the case of the Ju 88, 50,000 modifications had to be made. The weight was increased from seven to twelve tons. This resulted in a speed loss of 200 km/h. Udet merely conveyed OKL's own dive bombing capability request to Ernst Heinkel concerning the He 177, who vehemently opposed such an idea, which ruined its development as a heavy bomber. Göring was not able to rescind the dive bombing requirement for the He 177A until September 1942. By the summer of 1939, the Luftwaffe had ready for combat nine Jagdgeschwader ("fighter wings") mostly equipped with the Messerschmitt Bf 109E, four 'Zerstörergeschwader ("destroyer wings") equipped with the Messerschmitt Bf 110 heavy fighter, 11 Kampfgeschwader (bomber wings) equipped mainly with the Heinkel He 111 and the Dornier Do 17Z, and four Sturzkampfgeschwader ("dive bomber wings") primarily armed with the iconic Junkers Ju 87B Stuka. The Luftwaffe was just starting to accept the Junkers Ju 88A for service, as it had encountered design difficulties, with only a dozen aircraft of the type considered combat-ready. The Luftwaffe's strength at this time stood at 373,000 personnel (208,000 flying troops, 107,000 in the Flak Corps and 58,000 in the Signals Corps). Aircraft strength was 4,201 operational aircraft: 1,191 bombers, 361 dive bombers, 788 fighters, 431 heavy fighters, and 488 transports. Despite deficiencies it was an impressive force. In April and May 1941, Udet headed the Luftwaffe delegation inspecting Soviet aviation industry in compliance with the Molotov–Ribbentrop Pact. Udet informed Göring "that Soviet air forces are very strong and technically advanced." Göring decided not to report the facts to Hitler, hoping that a surprise attack would quickly destroy the USSR. Udet realized that the upcoming war on Russia might cripple Germany. Udet, torn between truth and loyalty, suffered a psychological breakdown and even tried to tell Hitler the truth, but Göring told Hitler that Udet was lying, then took Udet under control by giving him drugs at drinking parties and hunting trips. Udet's drinking and psychological condition became a problem, but Göring used Udet's dependency to manipulate him. Nuremberg trials. Defendants in the dock. The main target of the prosecution was Hermann Göring (at the left edge on the first row of benches), considered to be the most important surviving official in the Third Reich after Hitler's death. Throughout the history of Nazi Germany, the Luftwaffe had only two commanders-in-chief. The first was Hermann Göring, with the second and last being Generalfeldmarschall Robert Ritter von Greim. His appointment as commander-in-chief of the Luftwaffe was concomitant with his promotion to Generalfeldmarschall, the last German officer in World War II to be promoted to the highest rank. Other officers promoted to the second highest military rank in Germany were Albert Kesselring, Hugo Sperrle, Erhard Milch, and Wolfram von Richthofen. At the end of the war, with Berlin surrounded by the Red Army, Göring suggested to Hitler that he take over leadership of the Reich. Hitler ordered his arrest and execution, but Göring's SS guards did not carry out the order, and Göring survived to be tried at Nuremberg. Sperrle was prosecuted at the OKW Trial, one of the last twelve of the Nuremberg Trials after the war. He was acquitted on all four counts. He died in Munich in 1953. At the start of the war the Luftwaffe had four Luftflotten ("air fleets"), each responsible for roughly a quarter of Germany. As the war progressed more air fleets were created as the areas under German rule expanded. As one example, Luftflotte 5 was created in 1940 to direct operations in Norway and Denmark, and other Luftflotten were created as necessary. Each Luftflotte would contain several Fliegerkorps (Air Corps), Fliegerdivision (Air Division), Jagdkorps (Fighter Corps),Jagddivision (Air Division) or Jagdfliegerführer (Fighter Air Command). Each formations would have attached to it a number of units, usually several Geschwader, but also independent Staffeln and Kampfgruppen. Luftflotten were also responsible for the training aircraft and schools in their operational areas. A Geschwader was commanded by a Geschwaderkommodore, with the rank of either major, Oberstleutnant (lieutenant colonel) or Oberst (colonel). Other "staff" officers within the unit with administrative duties included the adjutant, technical officer, and operations officer, who were usually (though not always) experienced aircrew or pilots still flying on operations. Other specialist staff were navigation, signals, and intelligence personnel. A Stabschwarm (headquarters flight) was attached to each Geschwader. A Jagdgeschwader ("fighter wing", literally "hunting wing") (JG) was a single-seat day fighter Geschwader, typically equipped with Bf 109 or Fw 190 aircraft flying in the fighter or fighter-bomber roles. Late in the war, by 1944–45, JG 7 and JG 400 (and the jet specialist JV 44) flew much more advanced aircraft, with JG 1 working up with jets at war's end. A Geschwader consisted of groups (Gruppen), which in turn consisted of Jagdstaffel (fighter squadrons). Hence, Fighter Wing 1 was JG 1, its first Gruppe (group) was I./JG 1, using a Roman numeral for the Gruppe number only, and its first Staffel (squadron) was 1./JG 1. Geschwader strength was usually 120 – 125 aircraft. The peacetime strength of the Luftwaffe in the spring of 1939 was 370,000 men. After the mobilization in 1939 almost 900,000 men served, and just before Operation Barbarossa in 1941 the personnel strength had reached 1.5 million men. Luftwaffe reached its largest personnel strength during the period November 1943 to June 1944, with almost three million men and women in uniform; 1.7 million of these were male soldiers, 1 million male Wehrmachtsbeamte and civilian employees, and almost 300,000 female and male auxiliaries (Luftwaffenhelfer). In October 1944, the anti-aircraft units had 600,000 soldiers and 530,000 auxiliaries, including 60,000 male members of the Reichsarbeitsdienst, 50,000 Luftwaffenhelfer (males age 15–17), 80,000 Flakwehrmänner (males above military age) and Flak-V-soldaten (males unfit for military service), and 160,000 female Flakwaffenhelferinnen and RAD-Maiden, as well as 160,000 foreign personnel (Hiwis). The Luftwaffe's Condor Legion experimented with new doctrine and aircraft during the Spanish Civil War. It helped the Falange under Francisco Franco to defeat the Republican forces. Over 20,000 German airmen gained combat experience that would give the Luftwaffe an important advantage going into the Second World War. One infamous operation was the bombing of Guernica in the Basque country. It is commonly assumed this attack was the result of a "terror doctrine" in Luftwaffe doctrine. The raids on Guernica and Madrid caused many civilian casualties and a wave of protests in the democracies. It has been suggested that the bombing of Guernica was carried out for military tactical reasons, in support of ground operations, but the town was not directly involved in any fighting at that point in time. It was not until 1942 that the Germans started to develop bombing policy in which civilians were the primary target, although The Blitz on London and many other British cities involved indiscriminate bombing of civilian areas, 'nuisance raids' which could even involve the machine-gunning of civilians and livestock. When World War II began, the Luftwaffe was one of the most technologically advanced air forces in the world. During the Polish Campaign that triggered the war, it quickly established air superiority, and then air supremacy. It supported the German Army operations which ended the campaign in five weeks. The Luftwaffe's performance was as OKL had hoped. The Luftwaffe rendered invaluable support to the army, mopping up pockets of resistance. Göring was delighted with the performance. Command and control problems were experienced, but owing to the flexibility and improvisation of both the army and Luftwaffe, these problems were solved. The Luftwaffe was to have in place a ground-to-air communication system, which played a vital role in the success of Fall Gelb. In the spring of 1940, the Luftwaffe assisted the Kriegsmarine and Heer in the invasion of Norway. Flying in reinforcements and winning air superiority, the Luftwaffe contributed decisively to the German conquest. In the spring of 1940, the Luftwaffe contributed to the unexpected success in the Battle of France. It destroyed three Allied Air Forces and helped secure the defeat of France in just over six weeks. However, it could not destroy the British Expeditionary Force at Dunkirk despite intense bombing. The BEF escaped to continue the war. Gun camera film shows tracer ammunition from a Supermarine Spitfire Mark I of No. 609 Squadron RAF, flown by Flight Lieutenant J. H. G. McArthur, hitting a Heinkel He 111 on its starboard quarter. During the Battle of Britain in summer 1940, the Luftwaffe inflicted severe damage to the Royal Air Force, but did not achieve the air superiority that Hitler demanded for the proposed invasion of Britain, which was postponed and then cancelled in December 1940. The Luftwaffe ravaged British cities during The Blitz, but failed to break British morale. Hitler had already ordered preparations to be made for Operation Barbarossa, the invasion of the Soviet Union. In spring 1941, the Luftwaffe helped its Axis partner, Italy, secure victory in the Balkans Campaign and continued to support Italy in the Mediterranean, Middle East and African theatres until May 1945. In June 1941, Germany invaded the Soviet Union. The Luftwaffe destroyed thousands of Soviet aircraft, yet it failed to destroy the Red Air Force altogether. Lacking strategic bombers (the very "Ural bombers" that General Wever had asked for six years before) the Luftwaffe could not strike at Soviet production centers regularly or with the needed force. As the war dragged on, the Luftwaffe was eroded in strength. The defeats at the Battle of Stalingrad and Battle of Kursk ensured the gradual decline of the Wehrmacht on the Eastern Front. British historian Frederick Taylor asserts that "all sides bombed each other's cities during the war. Half a million Soviet citizens, for example, died from German bombing during the invasion and occupation of Russia. That's roughly equivalent to the number of German citizens who died from Allied raids." Meanwhile, the Luftwaffe continued to defend German-occupied Europe against the growing offensive power of RAF Bomber Command and, starting in the summer of 1942, the steadily building strength of the United States Army Air Forces. The Defence of the Reich campaign gradually destroyed the Luftwaffe's fighter arm. Despite its belated use of advanced turbojet and rocket propelled aircraft for bomber destroyer duties, it was overwhelmed by Allied numbers and a lack of trained pilots and fuel. A last-ditch attempt, known as Operation Bodenplatte, to win air superiority on 1 January 1945 failed. After the Bodenplatte effort, the Luftwaffe ceased to be an effective fighting force. German day and night fighter pilots claimed more than 70,000 aerial victories during World War II. Of these, about 745 victories are estimated to be achieved by jet fighters. Flak shot down 25,000–30,000 Allied planes. Broken down on the different Allies, about 25,000 were American planes, about 20,000 British, 46,100 Soviet, 1,274 French, 375 Polish, and 81 Dutch as well as aircraft from other Allied nationalities. The highest scoring day fighter pilot was Erich Hartmann with 352 confirmed kills, all of them at the Eastern front against the Soviets. The leading aces in the west were Hans-Joachim Marseille with 158 kills against planes from the British Empire (RAF, RAAF, and SAAF) and Georg-Peter Eder with 56 kills of aircraft from the USAAF (of a total of 78). The most successful night fighter pilot was Heinz-Wolfgang Schnaufer, who is credited with 121 kills. 103 German fighter pilots shot down more than 100 enemy aircraft for a total of roughly 15,400 aerial victories. Roughly a further 360 pilots claimed between 40 and 100 aerial victories for round about 21,000 victories. Another 500 fighter pilots claimed between 20 and 40 victories for a total of 15,000 victories. It is relatively certain that 2,500 German fighter pilots attained ace status, having achieved at least five aerial victories.. These achievements were honored with 453 German single and twin-engine (Messerschmitt Bf 110) day fighter pilots having received the Knight's Cross of the Iron Cross. 85 night fighter pilots, including 14 crew members, were awarded the Knight's Cross of the Iron Cross. Some Bomber pilots were also highly successful. The Stuka and "Schlachtflieger" pilot Hans-Ulrich Rudel flew 2,530 ground-attack missions and claimed the destruction of more than 519 tanks and a battleship, among others. He was the most highly decorated German serviceman of the Second World War. The Bomber pilot Hansgeorg Bätcher flew more than 658 combat missions destroying numerous ships and other targets. The failure of the Luftwaffe in the Defence of the Reich campaign was a result of a number of factors. The Luftwaffe lacked an effective air defence system early in the war. Adolf Hitler's foreign policy had pushed Germany into war before these defences could be fully developed. The Luftwaffe was forced to improvise and construct its defences during the war. Most of the battles fought by the Luftwaffe on the Western Front were against the RAF's "Circus" raids and the occasional daylight raid into German air space. This was a fortunate position since the Luftwaffe's strategy of focusing its striking power on one front started to unravel with the failure of the invasion of the Soviet Union. The "peripheral" strategy of the Luftwaffe between 1939 and 1940 had been to deploy its fighter defences at the edges of Axis occupied territory, with little protecting the inner depths. Moreover, the front line units in the West were complaining about the poor numbers and performance of aircraft. Units complained of lack of Zerstörer aircraft with all-weather capabilities and the "lack of climbing power of the Bf 109". The Luftwaffe's technical edge was slipping as the only formidable new aircraft in the German arsenal was the Focke-Wulf Fw 190. Generalfeldmarschall Erhard Milch was to assist Ernst Udet with aircraft production increases and introduction of more modern types of fighter aircraft. However, they explained at a meeting of the Reich Industrial Council on 18 September 1941 that the new next generation aircraft had failed to materialize, and production of obsolete types had to continue to meet the growing need for replacements. Daytime aerial defense against the USAAF's strongly defended heavy bomber forces, particularly the Eighth Air Force and the Fifteenth Air Force, had its successes through the calendar year of 1943. But at the start of 1944, Eighth AF commander Jimmy Doolittle made a major change in offensive fighter tactics, which defeated the Luftwaffe's day fighter force from that time onwards. Steadily increasing numbers of the superlative North American P-51 Mustang single-engine fighter, leading the USAAF's bombers into German airspace defeated first the Bf 110 Zerstörer wings, then the Fw 190A Sturmböcke. The most troublesome of all German designs during WW II – both in development and in service – was the He 177A Greif heavy bomber. The greatest failure for the Kampfgeschwader, however, was being saddled with an aircraft intended as a capable four-engined heavy bomber: the perpetually troubled Heinkel He 177, whose engines were prone to catch fire in flight. Of the three parallel proposals from the Heinkel engineering departments for a four engined version of the A-series He 177 by February 1943, only one, the He 177B, emerged in the concluding months of 1943. Only three airworthy prototypes of the B-series He 177 design were produced by early 1944, some three years after the first prototype flights of the Avro Lancaster, the most successful RAF heavy bomber. Without specialised naval or land-based, purpose-designed maritime patrol aircraft, the Luftwaffe was forced to improvise. The Focke-Wulf Fw 200 Condor airliner's airframe – engineered for civilian airliner use – lacked the structural strength for combat maneuvering at lower altitudes, making it unsuitable for use as a bomber in maritime patrol duties. The Condor lacked speed, armour and bomb load capacity. Sometimes the fuselage literally "broke its back" or a wing panel dropped loose from the wing root after a hard landing. Nevertheless, this civilian transport was adapted for the long-range reconnaissance and anti-shipping roles and, between August 1940 and February 1941, Fw 200s sank 85 vessels for a claimed total of 363,000 Grt. Had the Luftwaffe focused on naval aviation – particularly maritime patrol aircraft with long range, like the aforementioned diesel-powered multi-engine Blohm & Voss flying boats – Germany might well have been in a position to win the Battle of the Atlantic. However, Raeder and the Kriegsmarine failed to press for naval air power until the war began, mitigating the Luftwaffe's responsibility. In addition, Göring regarded any other branch of the German military developing its own aviation as an encroachment on his authority and continually frustrated the Navy's attempts to build its own airpower. The absence of a strategic bomber force for the Luftwaffe, following General Wever's accidental death in the early summer of 1936 and the end of the Ural bomber program he fostered before the invasion of Poland, would not be addressed again until the authorization of the "Bomber B" design competition in July 1939, which sought to replace the medium bomber force with which the Luftwaffe was to begin the war, and the partly achieved Schnellbomber high-speed medium bomber concept with more advanced, twin-engined high speed bomber aircraft fitted with pairs of relatively "high-power" engines of 1,500 kW (2,000 hp) output levels and upwards each as a follow-on to the earlier Schnellbomber project, that would also be able to function as shorter range heavy bombers. The spring 1942 Amerika Bomber program also sought to produce useful strategic bomber designs for the Luftwaffe, with their prime design priority being an advanced trans-oceanic range capability as the main aim of the project to directly attack the United States from Europe or the Azores. Inevitably, both the Bomber B and Amerika Bomber programs were victims of the continued emphasis of the Wehrmacht combined military's insistence for its Luftwaffe air arm to support the Wehrmacht Heer (the regular German Army) as its primary mission, and the damage to the German aviation industry from Allied bomber attacks. The RLM's apparent lack of a dedicated "technical-tactical" department, that would have directly been in contact with combat pilots to assess their needs for weaponry upgrades and tactical advice, had never been seriously envisioned as a critically ongoing necessity in the planning of the original German air arm. The RLM did have its own Technisches Amt (T-Amt) department to handle aviation technology issues, but this was tasked with handling all aviation technology issues in the Third Reich, both military and civilian in nature, and also not known to have ever had any clear and actively administrative and consultative links with the front-line forces established for such purposes. On the front-line combat side of the issue, and for direct contact with the German aviation firms making the Luftwaffe's warplanes, the Luftwaffe did have its own reasonably effective system of four military aviation test facilities, or Erprobungstellen located at three coastal sites – Peenemünde-West (also incorporating a separate facility in nearby Karlshagen), Tarnewitz and Travemünde – and the central inland site of Rechlin, itself first established as a military airfield in late August 1918 by the German Empire, with the four-facility system commanded later in World War II by Oberst (Colonel) Edgar Petersen. However, due to lack of co-ordination between the RLM and OKL, all fighter and bomber development was oriented toward short range aircraft, as they could be produced in greater numbers, rather than quality long range aircraft, something that put the Luftwaffe at a disadvantage as early as the Battle of Britain. The "ramp-up" to production levels required to fulfill the Luftwaffe's front-line needs was also slow, not reaching maximum output until 1944. Production of fighters was not given priority until 1944; Adolf Galland commented that this should have occurred at least a year earlier. Galland also pointed to the mistakes and challenges made in the development of the Messerschmitt Me 262 jet – which included the protracted development time required for its Junkers Jumo 004 jet engines to achieve reliability. German combat aircraft types that were first designed and flown in the mid-1930s had become obsolete, yet were kept in production, in particular the Ju 87 Stuka, and the Bf 109, because there were no well-developed replacement designs. The appointment of Albert Speer as Minister of Armaments increased production of existing designs, and the few new designs that had originated from earlier in the war. However the intensification of Allied bombing caused the dispersion of production and prevented an efficient acceleration of expansion. German aviation production reached about 36,000 combat aircraft for 1944. However, by the time this was achieved the Luftwaffe lacked the fuel and trained pilots to make this achievement worth while. By the late 1930s, airframe construction methods had progressed to the point where airframes could be built to any required size, founded on the all-metal airframe design technologies pioneered by Hugo Junkers in 1915 and constantly improved upon for over two decades to follow – especially in Germany with aircraft like the Dornier Do X flying boat and the Junkers G 38 airliner. However, powering such designs was a major challenge. Mid-1930s aero engines were limited to about 600 hp and the first 1000 hp engines were just entering the prototype stage – for the then-new Third Reich's Luftwaffe air arm, this meant inverted. liquid-cooled V12 designs like the Daimler-Benz DB 601. The United States had already gotten its start towards this goal by 1937 with two large displacement, twin-row 18-cylinder air-cooled radial engine designs of at least 46 litres (2,800 in3) displacement each: the Pratt & Whitney Double Wasp and the Wright Duplex-Cyclone. Nazi Germany's initial need for substantially more powerful aviation engines originated with the private venture Heinkel He 119 high-speed reconnaissance design, and the ostensibly twin-"engined" Messerschmitt Me 261 for maritime reconnaissance duties – to power each of these designs, Daimler-Benz literally "doubled-up" their new, fuel-injected DB 601 engines. This "doubling-up" involved placing two DB 601s side-by-side on either side of a common vertical-plane space frame with their crankcases' outer sides each having a mount similar to what would be used in a single-engine installation, creating a "mirror-image" centrifugal supercharger for the starboard-side component DB 601, inclining the top ends of their crankcases inwards by roughly 30º to mate with the space-frame central mount, and placing a common propeller gear reduction housing across the front ends of the two engines. Such a twin-crankcased "power system" aviation engine crafted from a pair of DB 601s resulted in the 2,700 PS (1,986 kW) maximum output DB 606 "coupled" engine design for these two aircraft in February 1937, but with each of the DB 606 "coupled" engines weighing in at around 1.5 tonnes apiece. The early development of the DB 606 "coupled" engines, was paralleled during the late 1930s with Daimler-Benz's simultaneous development of a 1,500 kW class engine design using a single crankcase. The result was the twenty-four cylinder Daimler-Benz DB 604 X-configuration engine, with four banks of six cylinders each. Possessing essentially the same displacement of 46.5 litres (2830 in3) as the initial version of the liquid-cooled Junkers Jumo 222 multibank engine, itself a "converse" choice in configuration to the DB 604 in possessing six banks of four inline cylinders apiece instead; coincidentally, both the original Jumo 222 design and the DB 604 each weighed about a third less (at some 1,080 kg/2,379 lb of dry weight) than the DB 606, but the DB 604's protracted development was diverting valuable German aviation powerplant research resources, and with more development of the "twinned-DB 605" based DB 610 coupled engine (itself initiated in June 1940 with top output level of 2950 PS (2,909 hp), and brought together in the same way – with the same all-up weight of 1.5 tonnes – as the DB 606 had been) giving improved results at the time, the Reich Air Ministry stopped all work on the DB 604 in September 1942. Such "coupled powerplants" were the exclusive choice of power for the Heinkel He 177A Greif heavy bomber, mistasked from its beginnings in being intended to do moderate-angle "dive bombing" for a 30-meter wingspan class, heavy bomber design – the twin nacelles for a pair of DB 606s or 610s did reduce drag for such a combat "requirement", but the poor design of the He 177A's engine accommodations for these twin-crankcase "power systems" caused repeated outbreaks of engine fires, causing the "dive bombing" requirement for the He 177A to be cancelled by mid-September 1942. BMW worked on what was essentially an enlarged version of its highly successful BMW 801 design from the Focke-Wulf Fw 190A. This led to the 53.7-litre displacement BMW 802 in 1943, an eighteen-cylinder air-cooled radial, which nearly matched the American Duplex-Cyclone's 54.9-litre figure, and the even larger, 83.5-litre displacement BMW 803 28-cylinder liquid-cooled radial, which from post-war statements from BMW development personnel were each considered to be "secondary priority" development programs at best. This situation with the 802 and 803 designs led to the company's engineering personnel being redirected to place all efforts on improving the 801 to develop it to its full potential. The BMW 801F radial development, through its use of features coming from the 801E subtype, was able to substantially exceed the over-1,500 kW output level. The two closest Allied equivalents to the 801 in configuration and displacement – the American Wright Twin Cyclone, and the Soviet Shvetsov ASh-82 radials – never had any need to be developed beyond a 1,500 kW output level, as larger-displacement, 18-cylinder radial aviation engines in both nations (the aforementioned American Double Wasp and Duplex-Cyclone) and the eventual 1945 premiere of the Soviet Shvetsov ASh-73 design, all three of which started their development before 1940, handled needs for even greater power from large radial aviation engines. Only the twinned-up Daimler-Benz DB 601-based, 1,750 kW output designated the DB 606, and its more powerful descendant, the 2,130 kW output DB 605-based DB 610, each of some 1.5 tonnes weight apiece, were the only 1,500 kW-plus output level aircraft powerplants to ever be produced by Germany for its front-line Luftwaffe combat aircraft, mostly for the powerplants of the aforementioned Heinkel He 177A heavy bomber. Even the largest-displacement inverted V12 aircraft powerplant built in Germany, the 44.52-litre (2,717 cu. in.) Daimler-Benz DB 603, which saw widespread use in twin-engined designs, could not exceed the 1,500 kW output level without more development. By March 1940, even the DB 603 was being "twinned-up" as the 601/606 and 605/610 had been, to become their replacement "power system": this was the strictly experimental, approximately 1.8-tonne weight apiece, twin-crankcase DB 613; capable of over 2,570 kW (3,495 PS) output, but which never left its test phase. The proposed over-1,500 kW output subtypes of German aviation industry's existing piston aviation engine designs—which adhered to using just a single crankcase that were able to substantially exceed the aforementioned over-1,500 kW output level—were the DB 603 LM (1,800 kW at take-off, in production), the DB 603 N (2,205 kW at take-off, planned for 1946) and the BMW 801F (1,765 kW (2,400 PS) engines. The pioneering nature of jet engine technology in the 1940s resulted in numerous development problems for both of Germany's major jet engine designs to see mass production, the Jumo 004 and BMW 003 (both of pioneering axial flow design), with the more powerful Heinkel HeS 011 never leaving the test phase, as only 19 examples of the HeS 011 would ever be built for development. Even with such dismal degrees of success for such advanced aviation powerplant designs, more and more design proposals for new German combat aircraft in the 1943–45 period centered either around the failed Jumo 222 or HeS 011 aviation powerplants for their propulsion. The bomber arm was given preference and received the "better" pilots. Later, fighter pilot leaders were few in numbers as a result of this. As with the late shift to fighter production, the Luftwaffe pilot schools did not give the fighter pilot schools preference soon enough. The Luftwaffe, OKW argued, was still an offensive weapon, and its primary focus was on producing bomber pilots. This attitude prevailed until the second half of 1943. During the Defence of the Reich campaign in 1943 and 1944, there were not enough commissioned fighter pilots and leaders to meet attrition rates; as the need arose to replace aircrew (as attrition rates increased), the quality of pilot training deteriorated rapidly. Later this was made worse by fuel shortages for pilot training. Overall this meant reduced training on operational types, formation flying, gunnery training, and combat training, and a total lack of instrument training. Moreover, Luftwaffe leadership from the start poached the training command, which undermined its ability to replace losses, while also planning for "short sharp campaigns", which did not pertain. Moreover, no plans were laid for night fighters. In fact, when protests were raised, Hans Jeschonnek, Chief of the General Staff of the Luftwaffe, said, "First we've got to beat Russia, then we can start training!" One of the unique characteristics of the Luftwaffe (as opposed to other independent air forces) was the possession of an organic paratrooper force called Fallschirmjäger. These were established in 1938. They saw action in their proper role during 1940–1941, most notably in the capture of the Belgian army fortress at the Battle of Fort Eben-Emael and the Battle for The Hague in May 1940, and during the Battle of Crete in May 1941. However, more than 4,000 Fallschirmjäger were killed during the Crete operation. Afterwards, although continuing to be trained in parachute delivery, paratroopers were only used in a parachute role for smaller-scale operations, such as the rescue of Benito Mussolini in 1943. Fallschirmjäger formations were mainly used as crack foot infantry in all theatres of the war. Their losses were 22,041 KIA, 57,594 WIA and 44,785 MIA (until February 1945). During 1942 surplus Luftwaffe personnel (see above) was used to form the Luftwaffe Field Divisions, standard infantry divisions that were used chiefly as rear echelon units to free up front line troops. From 1943, the Luftwaffe also had an armoured paratroop division called Fallschirm-Panzer Division 1 Hermann Göring, which was expanded to a Panzerkorps in 1944. Ground support and combat units from the Reichsarbeitsdienst (RAD) and the National Socialist Motor Corps (NSKK) were also put to Luftwaffe's disposal during the war. In 1942 56 RAD companies served with the Luftwaffe in the West as airfield construction troops. In 1943 420 RAD companies were trained as anti-aircraft artillery (AAA) and posted to existing Luftwaffe AAA battalions in the homeland. At the end of the war, these units were also fighting allied tanks. Beginning in 1939 with a transport regiment, the NSKK had in 1942 a complete division sized transportation unit serving the Luftwaffe, the NSKK Transportgruppe Luftwaffe serving in France and at the Eastern front. The overwhelming number of its 12,000 members were Belgian, Dutch and French citizens. In 1943 and 1944, aircraft production was moved to concentration camps in order to alleviate labor shortages and to protect production from Allied air raids. The two largest aircraft factories in Germany were located at Mauthausen-Gusen and Mittelbau-Dora concentration camps. Aircraft parts were also manufactured at Flossenbürg, Buchenwald, Dachau, Ravensbrück, Gross-Rosen, Natzweiler, Herzogenbusch, and Neuengamme. In 1944 and 1945, as many as 90,000 concentration prisoners worked in the aviation industry, and were about one tenth of the concentration camp population over the winter of 1944–45. [N 3] Partly in response to the Luftwaffe's demand for more forced laborers to increase fighter production, the concentration camp more than doubled between mid-1943 (224,000) and mid-1944 (524,000). Part of this increase was due to the deportation of the Hungarian Jews; the Jägerstab program was used to justify the deportations to the Hungarian government. Of the 437,000 Hungarian Jews deported between May and July 1944, about 320,000 were gassed on arrival at Auschwitz and the remainder forced to work. Only 50,000 survived. Almost 1,000 fuselages of the jet fighter Messerschmitt Me 262 were produced at Gusen, a subcamp of Mauthausen and brutal Nazi labor camp, where the average life expectancy was six months. By 1944, one-third of production at the crucial Regensburg plant that produced the Bf 109, the backbone of the Luftwaffe fighter arm, originated in Gusen and Flossenbürg alone. Synthetic oil was produced from shale oil deposits by prisoners of Mittlebau-Dora as part of Operation Desert directed by Edmund Geilenberg in order to make up for the decrease in oil production due to Allied bombing. For oil production, three subcamps were constructed and 15,000 prisoners forced to work in the plant. More than 3,500 people died. Vaivara concentration camp in Estonia was also established for shale oil extraction; about 20,000 prisoners worked there and more than 1,500 died at Vaivara. Luftwaffe airfields were frequently maintained using forced labor. Thousands of inmates from five subcamps of Stutthof worked on the airfields. Airfields and bases near several other concentration camps[N 4] and ghettos[N 5] were constructed or maintained by prisoners. On the orders of the Luftwaffe, prisoners from Buchenwald and Herzogenbusch were forced to defuse bombs that had fallen around Düsseldorf and Leeuwarden respectively. Thousands of Luftwaffe personnel worked as concentration camp guards. Auschwitz included a munitions factory guarded by Luftwaffe soldiers; 2,700 Luftwaffe personnel worked as guards at Buchenwald. Dozens of camps and subcamps were staffed primarily by Luftwaffe soldiers. [N 6] According to the Encyclopedia of Camps and Ghettos, it was typical for camps devoted to armaments production to be run by the branch of the Wehrmacht that used the products. In 1944, many Luftwaffe soldiers were transferred to concentration camps to alleviate personnel shortages. Luftwaffe paratroopers murder civilians in Kondomari, Crete. Luftwaffe paratroopers committed many war crimes in Crete following the Battle of Crete, including the Alikianos executions, Massacre of Kondomari, and the Razing of Kandanos. Several Luftwaffe divisions, including the 1st Parachute Division, 2nd Parachute Division, 4th Parachute Division, 19th Luftwaffe Field Division, 20th Luftwaffe Field Division and the 1st Fallschirm-Panzer Division, committed war crimes in Italy, murdering hundreds of civilians. Luftwaffe troops participated in the murder of Jews imprisoned in ghettos in Eastern Europe, for example assisting in the murder of 2,680 Jews at the Nemirov ghetto, participating in a series of massacres at the Opoczno ghetto, and helping to liquidate the Deblin-Irena ghetto by deporting thousands of Jews to the Treblinka extermination camp. Between 1942 and 1944, two Luftwaffe security battalions were stationed in the Białowieża Forest for Bandenbekämpfung[N 7] operations. Encouraged by Göring, they murdered thousands of Jews and other civilians. Luftwaffe soldiers frequently executed Polish civilians at random with baseless accuastions of being "Bolshevik agents", in order to keep the population in line, or as reprisal for partisan activities. The performance of the troops was measured by the body count of people murdered. Ten thousand Luftwaffe troops were stationed on the Eastern Front for such "anti-partisan" operations. 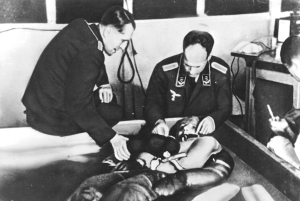 Professor Ernst Holzlöhner (left) and Luftwaffe doctor Sigmund Rascher (right) perform a cold water immersion experiment at Dachau. The subject is wearing an experimental Luftwaffe garment. Throughout the war, concentration camp prisoners were forced to serve as human guinea pigs in testing Luftwaffe equipment. Some were carried out by Luftwaffe personnel and others were performed by the SS on the orders of the OKL. In 1941, experiments with the intent of discovering means to prevent and treat hypothermia were carried out for the Luftwaffe, which had lost aircrew to immersion hypothermia after ditchings. The experiments were conducted at Dachau and Auschwitz. Sigmund Rascher, a Luftwaffe doctor based at Dachau, published the results at the 1942 medical conference entitled "Medical Problems Arising from Sea and Winter". Of about 400 prisoners forced to participate in cold-water experiments, 80 to 90 were killed. In early 1942, prisoners at Dachau were used by Rascher in experiments to perfect ejection seats at high altitudes. A low-pressure chamber containing these prisoners was used to simulate conditions at altitudes of up to 20,000 metres (66,000 ft). It was rumoured that Rascher performed vivisections on the brains of victims who survived the initial experiment. Of the 200 subjects, 80 died from the experimentation, and the others were executed. Eugen Hagen, head doctor of the Luftwaffe, infected inmates of Natzweiler concentration camp with typhus in order to test the efficacy of proposed vaccines. No positive or specific customary international humanitarian law with respect to aerial warfare existed prior to and during World War II. This is also why no Luftwaffe officers were prosecuted at the post-World War II Allied war crime trials for the aerial raids. The bombing of Wieluń was an air raid on the Polish town of Wieluń by the Luftwaffe on 1 September 1939. The Luftwaffe started bombing Wieluń at 04:40, five minutes before the shelling of Westerplatte, which has traditionally been considered the beginning of World War II in Europe. The air raid on the town was one of the first aerial bombings of the war. About 1,300 civilians were killed, hundreds injured, and 90 percent of the town centre was destroyed. The casualty rate was more than twice as high as Guernica. A 1989 Sender Freies Berlin documentary stated that there were no military or industrial targets in the area, except for a small sugar factory in the outskirts of the town. Furthermore, Trenkner stated that German bombers first destroyed the town's hospital. Two attempts, in 1978 and 1983, to prosecute individuals for the bombing of the Wieluń hospital were dismissed by West German judges when prosecutors stated that the pilots had been unable to make out the nature of the structure due to fog. Operation Retribution was the April 1941 German bombing of Belgrade, the capital of the Kingdom of Yugoslavia. The bombing deliberately targeted the killing of civilians as punishment, and resulted in 17,000 civilian deaths. It occurred in the first days of the World War II German-led Axis invasion of Yugoslavia. The operation commenced on 6 April and concluded on 7 or 8 April, resulting in the paralysis of Yugoslav civilian and military command and control, widespread destruction in the centre of the city and many civilian casualties. Following the Yugoslav capitulation, Luftwaffe engineers conducted a bomb damage assessment in Belgrade. The report stated that 218.5 metric tons (215.0 long tons; 240.9 short tons) of bombs were dropped, with 10 to 14 percent being incendiaries. It listed all the targets of the bombing, which included: the royal palace, the war ministry, military headquarters, the central post office, the telegraph office, passenger and goods railway stations, power stations and barracks. It also mentioned that seven aerial mines were dropped, and that areas in the centre and northwest of the city had been destroyed, comprising 20 to 25 percent of its total area. Some aspects of the bombing remain unexplained, particularly the use of the aerial mines. In contrast, Pavlowitch states that almost 50 percent of housing in Belgrade was destroyed. After the invasion, the Germans forced between 3,500 and 4,000 Jews to collect rubble that was caused by the bombing. Several prominent Luftwaffe commanders were convicted of war crimes, including General Alexander Löhr and Field Marshal Albert Kesselring. ^ Official dissolution of the Wehrmacht, including the Luftwaffe, began with Proclamation No. 2 of the Allied Control Council on 20 September 1945 and was not complete until Order No. 34 of 20 August 1946. ^ Luftwaffe is also the generic term in German-speaking countries for any national military aviation service, and the names of air forces in other countries are usually translated into German as "Luftwaffe" (e.g. Royal Air Force is often translated as "britische Luftwaffe"). However, Luftstreitkräfte, or "air armed force", is also sometimes used as a translation of "air force" for post-World War I air arms, as it was used as the first word of the official German name of the former East German Air Force. Since "Luft" translates into English as "air", and "Waffe" may be translated into English as either "weapon" or "arm", "Air Arm" may be considered the most literal English translation of Luftwaffe (cf. Fleet Air Arm). ^ a b In January 1944, Messerschmitt and contractors were using 7564 concentration camp prisoners, Heinkel and subsidiaries employed a further 9724, and Junkers used 1571. Heinkel used forced labor at Mielec and the Mauthausen subcamps Wien-Florisdorf, Hinterbrühl, and Schwechat. Junkers had factories at Wiener Neudorf (also a subcamp of Mauthausen); and operated factories at Buchenwald subcamps Mühlhausen, Stempeda and Harzungen. ^ See Luftwaffe guards at concentration camps for a full list. ^ "Control Council Law No. 34, Resolution of the Wehrmacht of 20 August 1946" (in German). Official Gazette of the Control Council for Germany, 1 May 2004 – 7 June 2004, p. 172. ^ Tom Philo. "WWII production figures". Taphilo.com. Archived from the original on 26 March 2017. Retrieved 26 April 2014. ^ Jason Pipes (2008). "Statistics and Numbers". Feldgrau.com. Archived from the original on 26 March 2017. Retrieved 26 April 2014. ^ Hartmann, Bert. "Luftarchiv.de – Kennzeichen – Allgemein, Abb.4 – Balkenkreuz auf Flügelunterseite und Rumpf". Luftarchiv.de. Archived from the original on 17 November 2015. Retrieved 15 April 2018. ^ Hartmann, Bert. "Luftarchiv.de – Kennzeichen – Allgemein, Abb.4 – Balkenkreuz auf Flügeloberseite". Luftarchiv.de. Archived from the original on 17 November 2015. Retrieved 15 April 2018. ^ Hartmann, Bert. "Luftarchiv.de – Kennzeichen – Varianten des Hakenkreuzes, Abb.2". Luftarchiv.de. Archived from the original on 17 November 2015. Retrieved 14 April 2018. ^ "Entry in German dictionary Duden". Archived from the original on 24 February 2016. Retrieved 16 February 2016. ^ Griehl & Dressel1998, p. 9. ^ Dressel & Griehl 1994, p. 176. ^ Ketley & Rolfe 1996, p. 3. ^ Ketley & Rolfe 1996, p. 7. ^ Griehl & Dressel 1998, p. 53. ^ a b c d "High Command of the Luftwaffe". feldgrau.com. Archived from the original on 17 June 2017. Retrieved 26 September 2012. ^ Der Einsatz von Behelfspersonal bei der Flak Archived 21 September 2016 at the Wayback Machine Retrieved Sept. 15, 2016. ^ Die Deutsche Luftwaffe in der Ostmark Archived 26 April 2017 at the Wayback Machine Retrieved Sept. 15, 2016. ^ Schramm, Percy E. (21 November 2012). "Die deutschen Verluste im Zweiten Weltkrieg". Die Zeit (in German). Archived from the original on 10 July 2018. Retrieved 1 February 2019. ^ "World War II: Yanagi Missions – Japan's Underwater Convoys". historynet.com. Historynet.com. 12 June 2006. Archived from the original on 2 April 2015. Retrieved 12 January 2015. ^ "B-29 Design/Devemopment – Engines". 468thbombgroup.org. Archived from the original on 30 June 2017. Retrieved 1 August 2013. ^ Dobosiewicz 2000, p. 194. ^ a b Vajda & Dancey 1998, p. 118. ^ Uziel 2011, pp. 180, 185. ^ Buggeln 2014, p. 45. ^ USHMM 2009, p. 870. ^ USHMM 2009, p. 958. ^ USHMM 2009, p. 959. ^ USHMM 2009, p. 962. ^ a b USHMM 2009, p. 955. ^ USHMM 2009, p. 396. ^ USHMM 2009, p. 999. ^ USHMM 2009, p. 984. ^ Buggeln 2014, p. 44. ^ Bauer 1994, pp. 155–156. ^ Buggeln 2014, pp. 46, 48. ^ a b "Messerschmitt GmbH Regensburg". www.mauthausen-memorial.org. Archived from the original on 28 July 2018. Retrieved 28 July 2018. ^ Bartrop & Dickerman 2017, p. 427. ^ "Gusen". www.ushmm.org. United States Holocaust Memorial Museum. Archived from the original on 8 July 2018. Retrieved 28 July 2018. ^ USHMM 2009, pp. 969, 1012–3. ^ USHMM 2009, p. 1292. ^ USHMM 2009, p. 1294. ^ USHMM 2009, pp. 1426, 1479. ^ USHMM 2009, p. 352. ^ USHMM 2009, p. 527. ^ USHMM 2009, p. 652. ^ USHMM 2009, p. 702. ^ USHMM 2009, p. 820. ^ USHMM 2009, p. 834. ^ USHMM 2012, p. 1078. ^ USHMM 2012, p. 1166. ^ USHMM 2012, p. 1288. ^ USHMM 2009, p. 336. ^ USHMM 2009, pp. 820–1. ^ USHMM 2009, p. 222. ^ USHMM 2009, p. 291. ^ USHMM 2009, pp. 1016–7. ^ Westermann, Edward B. (2016). Hitler's Ostkrieg and the Indian Wars: Comparing Genocide and Conquest. University of Oklahoma Press. ISBN 9780806157122. ^ Neal, Stephan D. Yada-Mc (2018). Places of Shame – German and Bulgarian war crimes in Greece 1941–1945. BoD – Books on Demand. p. 36. ISBN 9783744850735. ^ "On This Day June 3, 1941: What Happened to the Cretan Village of Kandanos When its Citizens Defended Their Homes from Invading Nazis? – The Pappas Post". The Pappas Post. 3 June 2018. Archived from the original on 22 August 2018. Retrieved 22 August 2018. ^ "1. Fallschirmjäger-Division" (in Italian). Atlas of Nazi and Fascist Massacres in Italy. Archived from the original on 21 September 2018. Retrieved 20 September 2018. ^ "3. Panzer Grenadier Division" (in Italian). Atlas of Nazi and Fascist Massacres in Italy. Archived from the original on 21 September 2018. Retrieved 20 September 2018. ^ "4. Fallschirm-Jäger-Division" (in Italian). Atlas of Nazi and Fascist Massacres in Italy. Archived from the original on 21 September 2018. Retrieved 20 September 2018. ^ "III. Gruppe/Luftwaffe-Artillerie-Regiment 19" (in Italian). Atlas of Nazi and Fascist Massacres in Italy. Archived from the original on 21 September 2018. Retrieved 20 September 2018. ^ "20. Luftwaffe-Feld-Division" (in Italian). Atlas of Nazi and Fascist Massacres in Italy. Archived from the original on 21 September 2018. Retrieved 20 September 2018. ^ "Fallschirm-Panzer-Division "Hermann Goring"" (in Italian). Atlas of Nazi and Fascist Massacres in Italy. Archived from the original on 21 September 2018. Retrieved 20 September 2018. ^ USHMM 2012, p. 1550. ^ USHMM 2012, p. 267. ^ USHMM 2012, p. 638. ^ Blood 2010, p. 249. ^ Blood 2010, p. 251, 266. ^ Blood 2010, p. 256. ^ Blood 2010, p. 262. ^ Blood 2010, p. 258. ^ Blood 2010, p. 252. ^ a b c d USHMM 2009, p. 444. ^ a b Tyson, Peter. "Holocaust on Trial: The Experiments." Archived 4 September 2017 at the Wayback Machine NOVA Online. Retrieved: 23 March 2008. ^ Cockburn & St. Clair 1999, pp. 149–150. ^ USHMM 2009, p. 1005. ^ Javier Guisández Gómez (30 June 1998). "The Law of Air Warfare". International Review of the Red Cross (323): 347–363. Archived from the original on 25 April 2013. ^ Terror from the Sky: The Bombing of German Cities in World War II. Berghahn Books. 2010. p. 167. ISBN 978-1-8454-5844-7. ^ a b Davies, Norman (29 August 2009). "We must not forget the real causes of the war". The Independent. Archived from the original on 26 January 2012. Retrieved 25 February 2010. ^ Słomińska, Sylwia. "Wieluń, 1 września 1939 r" (in Polish). Archived from the original on 2009-01-05. ^ a b Trenkner, Joachim (2008-08-29). "Wieluń, czwarta czterdzieści" [Wieluń, four forty am] (PDF) (in Polish). Archived from the original (PDF file, direct download 67.9 KB) on 2012-03-17. ^ Trenkner, Joachim (1 September 2009). "Ziel vernichtet" [Target destroyed]. Die Zeit (in German). 2003 (7). Archived from the original on 8 September 2009. Retrieved 4 June 2010. ^ Jolly 2010, p. 501. ^ Morrow 2014, p. 255. ^ Boog, Krebs & Vogel 2006, p. 366. ^ Pavlowitch 2007, pp. 17–18. ^ Ramet 2006, p. 131. ^ Tomasevich 2001, p. 756–757. ^ von Lingen 2009, pp. 110–118. Bartrop, Paul R.; Dickerman, Michael (2017). The Holocaust: An Encyclopedia and Document Collection [4 volumes]. ABC-CLIO. ISBN 9781440840845. Bauer, Yehuda (1994). Jews for Sale? : Nazi-Jewish Negotiations, 1933–1945. Yale University Press. ISBN 9780300059137. Blood, Philip W. (2001). Holmes, E. R., ed. Bandenbekämpfung: Nazi occupation security in Eastern Europe and Soviet Russia 1942–45 (PhD thesis). Cranfield University. Boog, Horst; Krebs, Gerhard; Vogel, Detlef (2006). Germany and the Second World War: Volume VII: The Strategic Air War in Europe and the War in the West and East Asia, 1943-1944/5. Clarendon Press. ISBN 978-0-19-822889-9. Buggeln, Marc (2014). Slave Labor in Nazi Concentration Camps. Oxford University Press. ISBN 9780191017643. Caldwell, Donald; Muller, Richard (2007). The Luftwaffe over Germany: Defense of the Reich. London: Greenhill Books. ISBN 978-1-85367-712-0. .
Corum, James. "The Luftwaffe's Army Support Doctrine, 1918–1941". The Journal of Military History, Vol. 59, No. 1, January 1995, pp. 53–76. Corum, James. The Roots of Blitzkrieg: Hans von Seeckt and German Military Reform. Modern War Studies. Lawrence: University Press of Kansas. 1992. ISBN 0-7006-0541-X. Dobosiewicz, Stanisław (2000). Mauthausen–Gusen; w obronie życia i ludzkiej godności [Mauthausen–Gusen; in defence of life and human dignity] (in Polish). Warsaw: Bellona. ISBN 978-83-11-09048-4. Hayward, Joel S. Stopped at Stalingrad: The Luftwaffe and Hitler's Defeat in the East 1942–1943. Lawrence, Kansas: University Press of Kansas, 2001. ISBN 0-7006-1146-0. Jolly, Philip (2010). Jewish Wielun – a Polish Shtetl. Philip Jolly. ISBN 9781445287737. Morrow, James D. (2014). Order within Anarchy: The Laws of War as an International Institution. Cambridge University Press. ISBN 9781139992893. Overy, Richard (1980). The Air War, 1939–1945. Washington: Potomac Books. ISBN 978-1-57488-716-7. Pavlowitch, Stevan K. (2007). Hitler's New Disorder: The Second World War in Yugoslavia. New York: Columbia University Press. ISBN 978-1-85065-895-5. Stedman, Robert F. (2012). Luftwaffe Air & Ground Crew 1939–45. Bloomsbury Publishing. ISBN 9781782006855. Tooze, Adam. The Wages of Destruction: The Making and Breaking of the Nazi Economy. London: Allen Lane, 2006. ISBN 0-7139-9566-1. USHMM (2009). Encyclopedia of Camps and Ghettos, 1933–1945. 1. United States Holocaust Memorial Museum. ISBN 978-0-253-35328-3. USHMM (2012). Dean, Martin, ed. Encyclopedia of Camps and Ghettos, 1933–1945. 2. United States Holocaust Memorial Museum. ISBN 978-0-253-00202-0. Vajda, Ferenc A.; Dancey, Peter (1998). German Aircraft Industry and Production, 1933-1945. McFarland. ISBN 9781853108648.